Reception: Dec. 1, 6pm – 8pmThis popular annual exhibition honors The Virgen de Guadalupe, patron saint of Mexico. Since 1992, Jose Vargas, the curator of the exhibition, has invited talented and diverse artists every year to create expressive and imaginative works of art that pay tribute to the “dark skinned Madonna.” The show has become a tradition in the Dallas-Fort Worth area and has been praised by the public for its original renditions of the iconic religious and cultural symbol. Any person visiting this exhibition, regardless of their faith or religion, can enjoy the colorful array of works of art portraying devotional and warm-hearted artistic expressions by various individuals. Jose Vargas has curated this exhibition since 1992. Mr. Vargas is an experienced visual artist and exhibition curator who has collaborated with the Oak Cliff Cultural Center and other City of Dallas cultural centers on numerous occasions, offering curatorial, art administration, and art logistic services. Join us for an afternoon of arts and crafts on December 8, 2018, at 2pm. 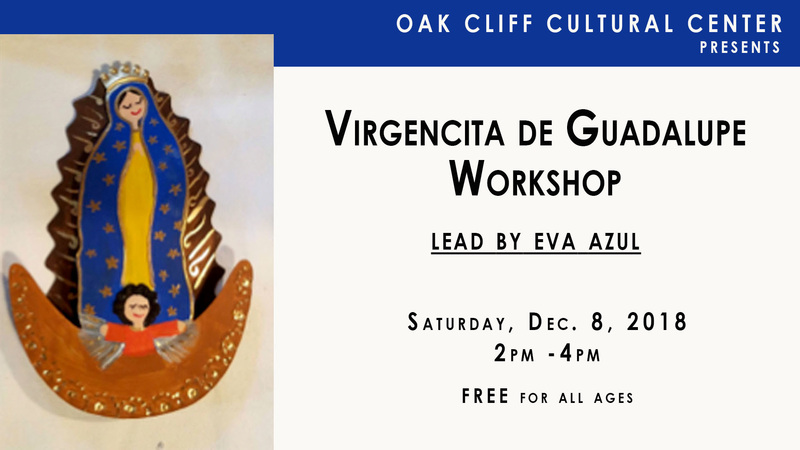 Local artist, Eva Azul will be leading a Virgencita de Guadalupe Workshop, where participants will paint their own Vrigen de Guadalupe made out of tin metal. Workshop starts at 2pm, but we advise participants to arrive 30min prior to ensure a spot. This event is FREE and no sign ups required.